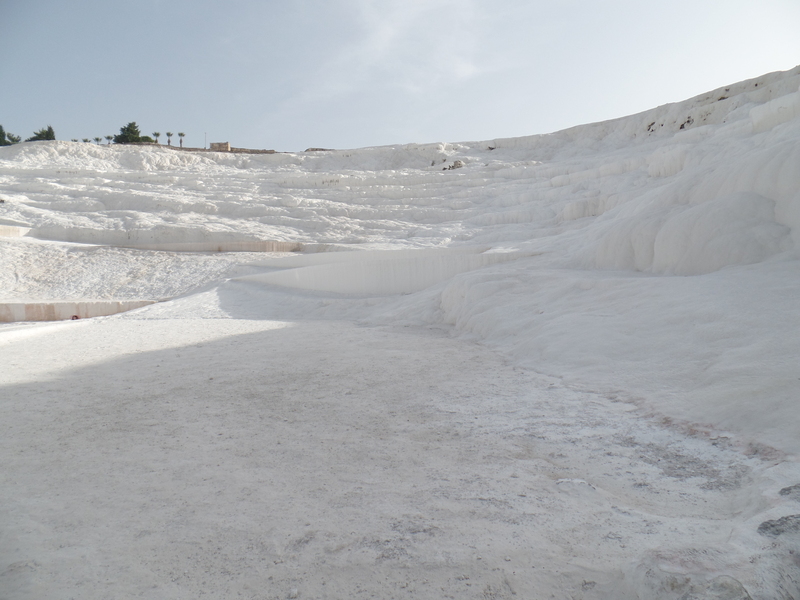 Today was our first full day in Pamukkale, Turkey. The name means “cotton castle” and it is famous for its travertine cliffs into which Romans, and others, built baths. 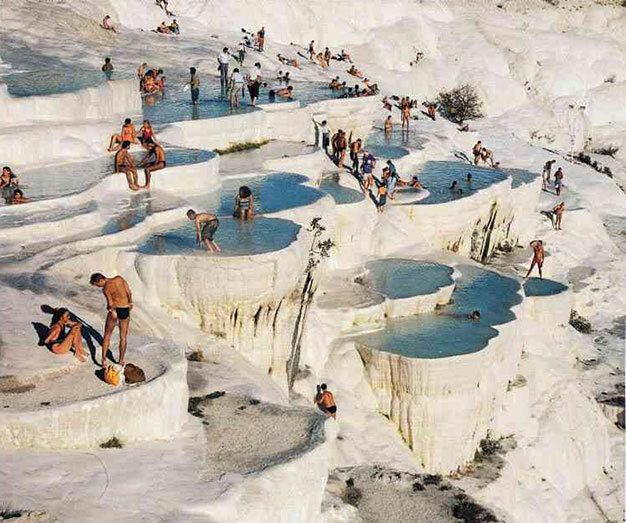 Pamukkale tourists before the limitations. 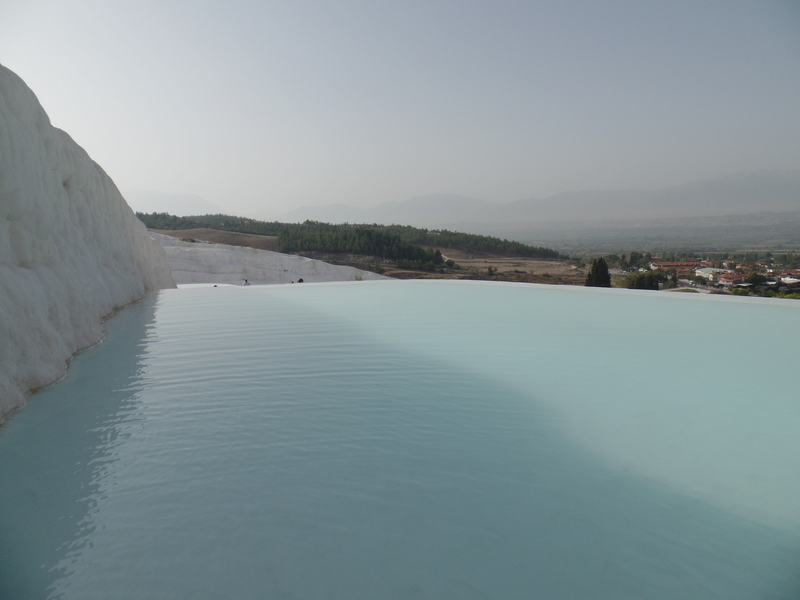 For centuries, the Pamukkale waters have been seen as a therapeutic treatment for various ills and people migrate here from around the world to bath in the waters. 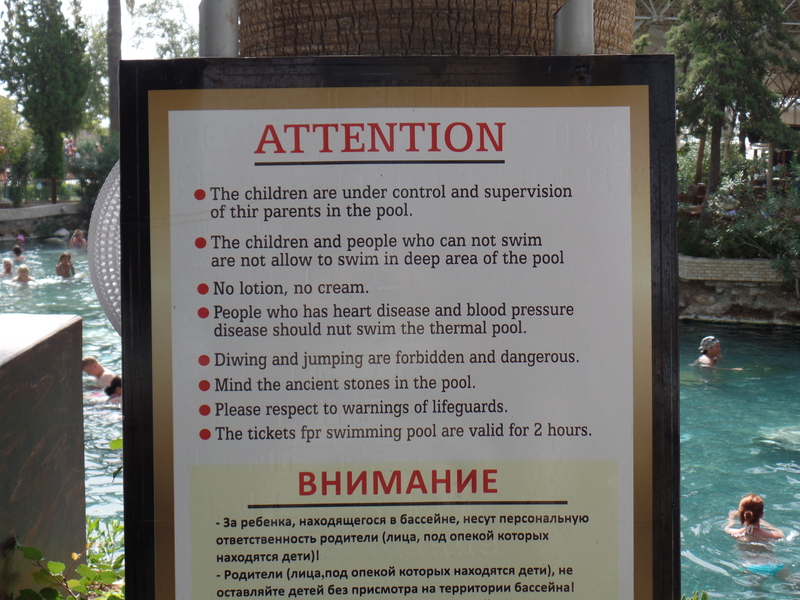 Tourists used to be able to enter many of the naturally and artificially constructed pools, but are now limited to certain areas due to the number of visitors. Below is an image from before the closure. Warm silty pools that drain into the horizon. They are formed by volcanic hot springs that bubble up limestone that then flows over the mountainside, gradually accumulating and solidifying. From afar, the cliff-side resembles a snow-covers slope. My mind convinced me that it would be soft, but, since it’s a mineral, it was, well, hard as rock, sometimes uncomfortably so. As it flows, it envelopes everything in its way, albeit very, very slowly, as is shown by the Roman mausoleum in the image on the right. We entered the area soon after it opened, so thankfully there were few people. But, by the time we left, around 12:30, there were thousands, mostly Russian and various Asian peoples. In fact, we were surprised the town has so many Asian themed restaurants. Most of the menus include various Korean, Chinese, and Japanese dishes and these were the first we had seen since we’d been in Turkey. To be honest, even though they are generally delicious, it was a welcome reprieve from kebabs for a day to have a differently themed food. Ancient tomb with Greek writing. Behind the white cliffs are the remains of an ancient Phrygian city, including a graveyard full of tombs. (Phrygians, you may remember, are famous for the legend of the Gordian Knot.) There were not as many well-preserved ruins as Ephesus, but they were of a different sort and spread over a much larger area. Turkey is so covered with ruins, it’s a bit overwhelming. 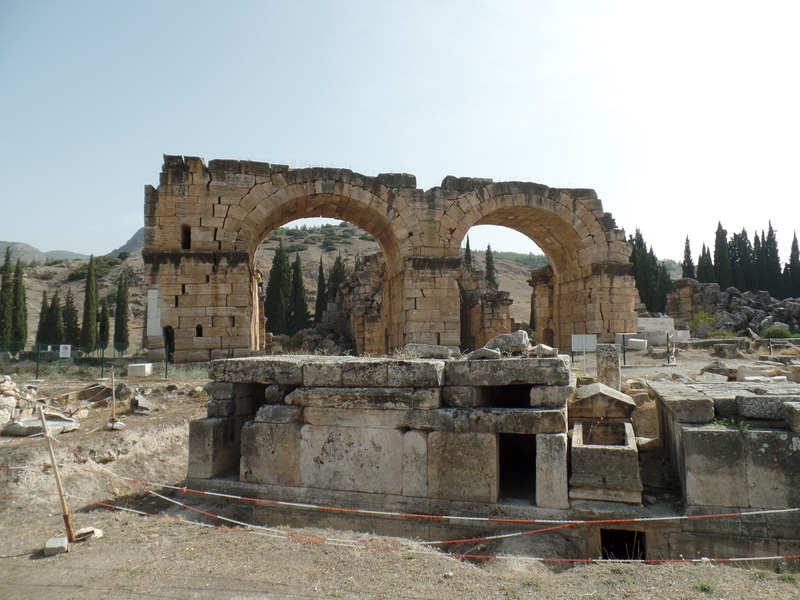 Seemingly every town has an aqueduct or some Roman columns just lying around. Places like the Hagia Sophia in Istanbul have so many, they just use them as benches for people to sit in the shade. 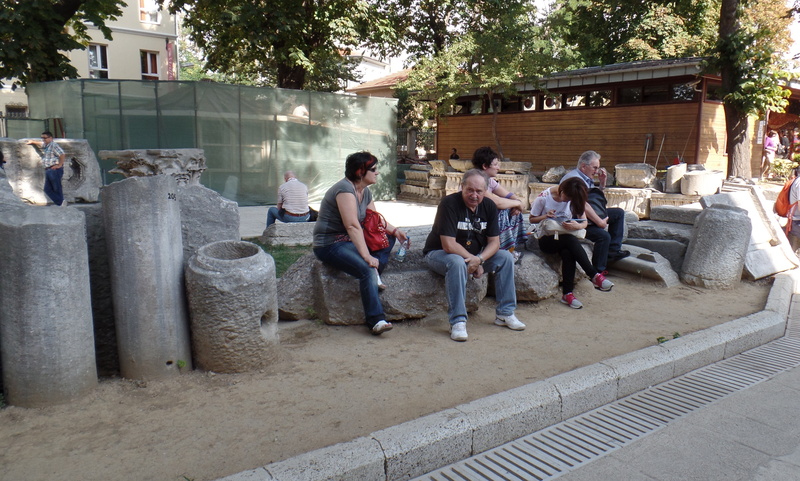 Extra ruins used as benches near the Hagia Sophia. As Americans, that’s a difficult thing to understand at times. Our history is so new, we treat every item as precious and enclose it in glass. 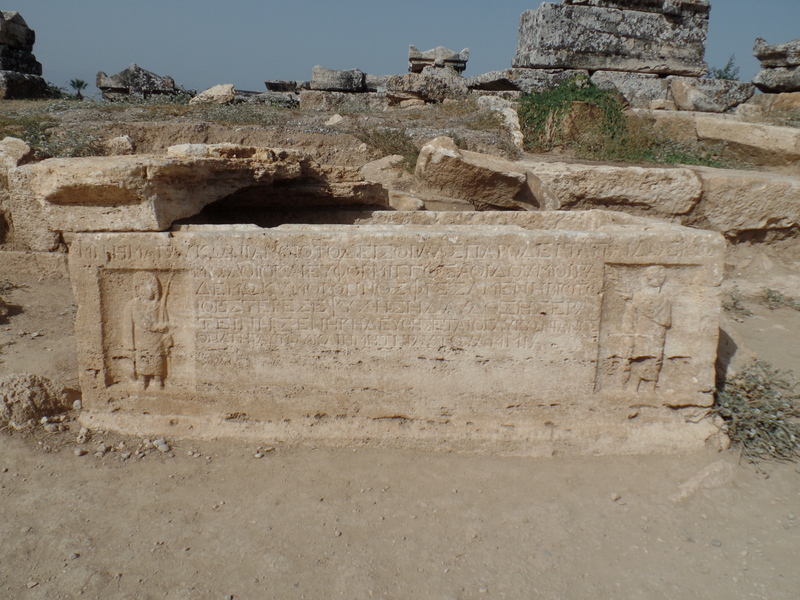 But in Turkey, there are so many, one can wander among and touch stone tablets over 2,000 years old. It’s bizarre. Tiny Turkish fishes nibble my heel. That being said, we couldn’t help ourselves when it came to Dr. Fish. Even if the claims are suspicious – that it will rejuvenate and remove dead skin – it was just strange enough to make it worthwhile. Tens of small fish nibbled gently at our feet for 20 minutes. It felt strangely electric, especially when they went between the toes and under the arch! Erika was in stitches from the tickling, but I was more fascinated. Here they are in action! Today is our last full day in Turkey as we head off tomorrow toward Greece. It has been an amazing time in an amazing country! Next stop, Rhodes!